Any businessman hates to lose a good client and Von Klugermann was one of my best. Those weekly letters to the Gräfin provided a steady flow of income and information for me. That “extra” that Leutnant Stachel had requested resulted in Klugermann’s Albatros being wrapped around a chimney at the abandoned factory on the edge of town. The clean-up process is routine for me, visit the crash site, document the facts, gather the remains and remove anything that could have value to ourselves or our enemies. This one was unusually ugly and very close to home. I was hard-pressed to find any part of Von Klugermann to salvage in the tangled mess at the base of the smokestack. His parents would have to be satisfied with a letter of condolence. Back at the office, Stachel debriefed Heidemann and Kettering on what happened. As usual, his description of the events was epic. Kettering came in and let them know that due to the heavy mist they could not confirm the kills. Heidemann, usually a stickler for the rules, immediately jumped on Kettering and insisted that he record the kills as confirmed. It appears that Stachel will be getting help from our Jastaführer in his goal to become an Ace. I saw that same puzzled look from the night before flash over Stachel’s face. He had miscalculated his place in line. He nodded politely and headed for the door in a hurry. On his way out Heidemann asked that Stachel gather Von Klugermann’s personal belongings and draft a note to be sent along to the family since they were such good friends. Good friends? If he only knew. That evening the events of the day made it hard for me to focus on the business at hand. Yvette was reluctant, but Dominique was an old pro. Most of the local French girls were more than willing. For some this was their only source of income and at home their families were starving. I tried to coach Yvette into the right position on the sofa as I adjusted the camera. Kettering’s clients had “specific” expectations so I had to get the angle just right. Stachel had dutifully dropped off the box with Von Klugermann’s’s belongings and a halfhearted attempt at a letter for his parents. 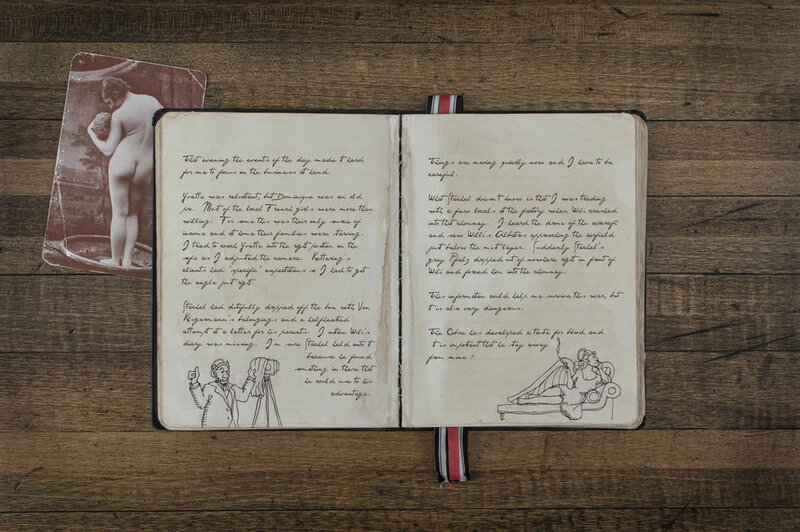 I notice Wili’s diary was missing. I’m sure Stachel held onto it because he found something in there that he could use to his advantage. Things are moving quickly now and I have to be careful. What Stachel doesn’t know is that I was trading with a few locals at the factory when Wili crashed into that chimney. I heard the drone of the aircraft and saw Wili’s Albatros approaching the airfield just below the mist layer. Suddenly Stachel’s gray Pfalz dropped out of nowhere right in front of Willi and forced him into the chimney. This information could help me survive this war, but it is also very dangerous. The Cobra has developed a taste for blood and it is important that I keep him away from mine! 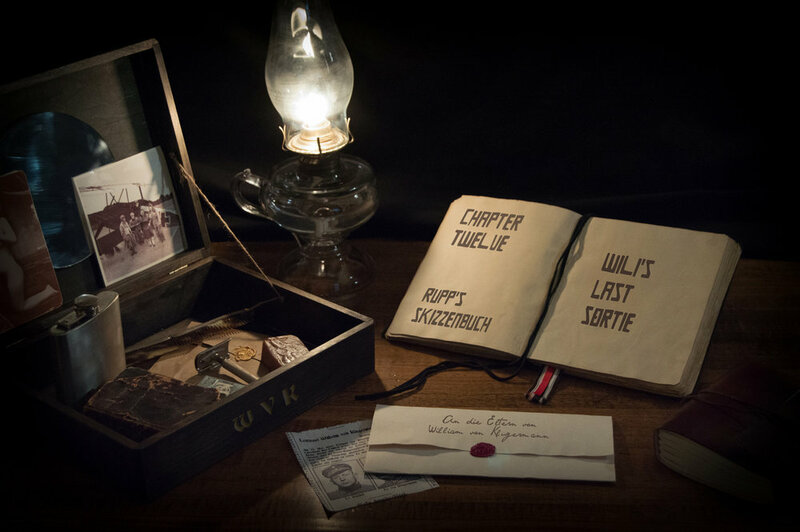 "Rupp's Skizzenbuch" is a simulation of a World War I soldier's journal and is a work of fiction. The characters and story are based on the novel "The Blue Max" written by Jack D. Hunter in 1964. Primary sources including photos, postcards and news headlines are interspersed in the fictional work to tie the story to real-world events during the Great War. To read more about the inspiration and sources for this project click on "Chapter 12 Credits" above.